Hello there! It’s been years (a few days) since I’ve posted anything. Sorry for suddenly going into hiding. Today marks the end of the first week of my exam not-so-much-week-but-fortnight and I’m already scared. Why? I’ll tell you why. So after my spanish orals and my tuesday off, my mock exams started on wednesday. I probably mentioned earlier that I started with english lit. It was the most hideous paper ever. Our english lit poetry exam is based around the theme of relationships. How then can you possibly ‘explore the thoughts and feelings of the poet’ when the poem is about a cat! Yes, you could argue that people love their cats but seriously, I had no idea whatsoever what this poet felt about her cat. It was just a description on how the cat ate. Seriously. That was it. 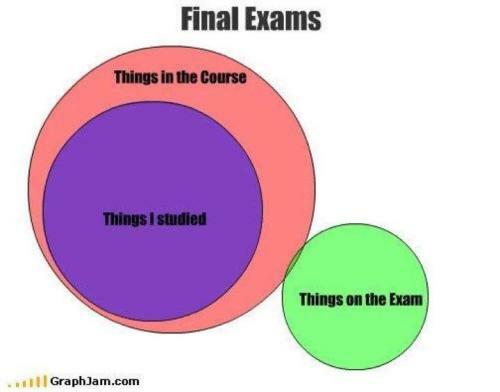 I hate exams. I had french directly afterwards and I had little time to revise before they shifted us the hall. The listening, my apologies to all French people, sounded like gibberish flowing through one ear and out the other. Normally, I’d be able to catch the gist of things, but for some reason, when you’re pack in a hall with a person’s voice resonating across the room and, other than that, complete silence, you tend to freak out a little. …the alarm bell went off. Yes, in the middle of the exam, the fire bell just randomly went off. Every head went up and looked towards the invigilators for some sort of order. They were stunned. They had no idea what was going on. Everyone stayed silent until I heard Grace laugh. “Are you serious? Are you actually serious?” After observing all this I simply dropped my head and continued with my exam. ‘Whatever.’ I thought. Of course, the invigilators then evacuated us into the playground and I was getting seriously annoyed. Who on Earth would be clumsy enough to schedule a fire drill during the year 11 mock exams??? And on Thursday of all days when it was icy cold. I was shivering and dancing about like a crazy person. My teeth chattered non-stop. A fire drill?! But when I thought about it, that would be probably unlikely. Then I wondered if there was a real fire and I felt less annoyed. Then I found out that the alarm was pulled by mistake. And to the guilty party I say thanks, for ruining my day and having me wait in the cold in absolute silent with the constant threat that my paper would be canceled hurled at me every few seconds. When the alarm finally when off, we went back in the hall and it turned out no one was paying attention to how much time was wasted and so there was this big debate (or, rather, argument) between the students and the invigilators over how much time we were going to ‘need’. After some heated conversation , 40 minutes were decided. When I finished the test, with plenty, and I mean plenty of time remaining, I realised that it was still registration. The invigilators were letting people leave early so I quickly left to run to my form room. Why? Let me explain. Earlier that day, I wanted to leave my coat in my locker so that people would trample on it when were were getting out bags and stuff out of this large cupboard we were forced to leave our stuff in. I thought this was a great idea. I wondered why I hadn’t thought of it earlier. My form tutor, however, told me that the room would be in use for the whole day for the year 10 business day (you will not believe the number of year 10 students who waltz into school with high heels and blazers. Well… at least they had fun.) and that I wouldn’t even be allowed to enter at break. Only lunch. ‘Lunch, eh?‘ I thought to myself. I was planning to buy something from the canteen at lunch since I didn’t bring any food with me. I’d eat my lunch, get my coat and then make my way to the hall for french. A seemingly flawless plan. Today was almost a bad. After leaving my coat in the large cupboard thingy, I had my maths exam in the morning which was okay, I guess. Didn’t strike me as too hard. Now all that’s left it the english language, the rest of the maths, R.E, science plus my spashish, music and french oral which I know none of and I just can’t forget my spanish one. This entry was posted in Uncategorized and tagged Evil papers, Exam Week, Exams, Fire alarm, My Coat.